Miranda Reading is a constant delight on Twitter, where she share her fabulous tales as Basbleuette. I am so excited to welcome her to the salon today to share her Modern Girl's Guide to Historical Living! By day, I’m researching my D.Phil at King’s College London. By night, I have a secret life, which makes even the most hard-bitten academic bite through their pencil. 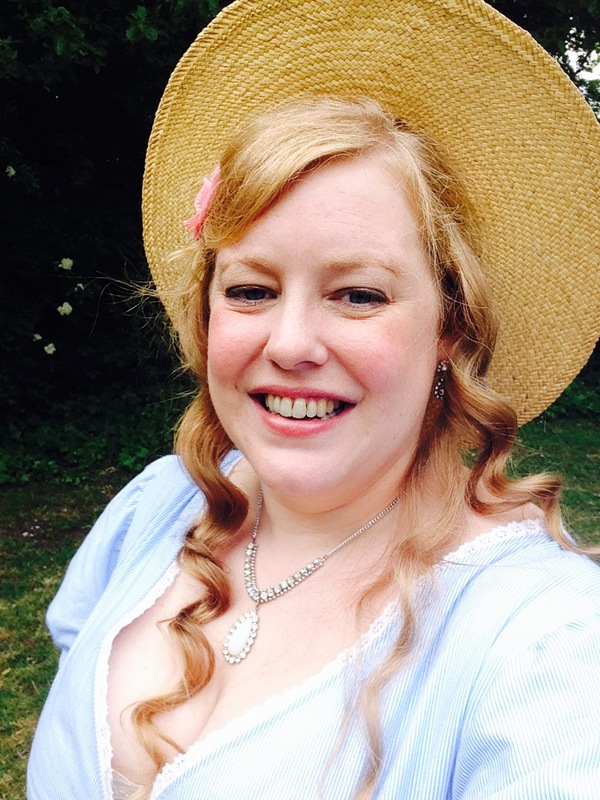 Yes, dear reader, I’m a historical re-enactor. The traditional reaction from academic historians is often similar to that experienced when confessing to a secret fondness for naughtiness with sheep. ‘But it’s not realistic!’ they cry. ‘It’s all about dressing up and drinking ale and no one ever dies during battle re-enactment!’ Death in the pursuit of making history has a glorious lineage (just ask Richard II, General James Wolfe or Admiral Horatio Nelson) but modern health and safety, like the Geneva Convention, tends to frown on shooting the French. Thankfully, as a woman of the eighteenth century, my preoccupation tends to be with ballrooms not bullets and no one has, as yet, died from executing a particularly difficult minuet - although hoop-related injury was one of the reasons that led to their banishment from Bath Assembly Rooms for country-dances in the mid-eighteenth century. So, in the spirit of true confession, my name is Lydia and I’m the Duchess of Richmond. Re-enactment is a very British tradition and you can (to coin a phrase) be whoever you want to be, an Elizabethan lady or maid at Kentwell Hall, a Cavalier or Roundhead with the Sealed Knot or a Corporal in the Home Guard at the Severn Valley Railway 1940’s weekend. We Brits, it seems, can’t get enough of spending our weekends as someone else and it’s a reflection of both an interest in and a desire to understand more about our past. Most re-enactors put a huge amount of work into ensuring historical accuracy in their dress, manner and actions. In the popular American Civil War re-enactment world, some Confederate soldiers march barefoot, forage off the land and starve themselves to attain a correct post-1863 style authentic leanness of look, earning themselves the soubriquet ‘hardcores’ for their dedication. The rest of us - I really can’t give up my hairdryer at a house party - are FARBS (noun) or Farbies, standing for ‘Far Be It From Authentic’ for not always going the whole hog. The world of re-enactment can occasionally go too far and as I said above, no one really wants to shoot the French. At least no more than a flesh wound. My own forays into re-enactment came through my study of historic dance of the seventeenth and eighteenth centuries, such as the minuet, contra-danse, cotillions and quadrilles. I wanted to be able to learn and perform the dances, as well as just reading about them. I quickly discovered that my skills could be practised at so-called ‘Playford’ balls (after The English Dancing Master by John Playford, one of the first commercially-produced dance manuals in 1651). So, with my somewhat reluctant husband in tow, off to Bath I went to dance at the Bath Minuet Society Georgian Ball and I’ve been an enthusiast ever since. Such was my desire to really try to experience the past that I branched off into doing my own events. 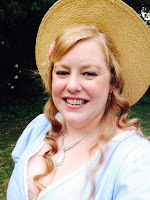 I attend two or three public re-enactments each year and also organise two private balls and an annual four-day Regency House party, which this year celebrates its tenth anniversary. Immersing yourself in this manner is not just a way to add some interest to your weekend if adultery and morris-dancing are unavailable. As a historian, re-enacting helps to connect you with the past via your research as you strive to make the event as authentic as you can manage. It encourages genuine scholarly research into matters such as patterns of speech, dance, social customs, etiquette, costume, food and other material preoccupations. There are many rich archival collections covering the eighteenth and nineteenth century and from the letters scribbled so long ago a wealth of detail about the day-to-day business of public sociability can be ascertained, transported into a modern day re-enactment and experienced first-hand. For a 21st century female, just putting on an eighteenth or nineteenth century dress changes the way you move. You soon realise that you can’t stride out like a modern liberated woman in her trousers, sit with your legs crossed or apart, eat much whilst wearing stays or easily pass through a doorway without banging your hair or your hoops. This physical restriction can make you appreciate how confining many of the fashions of the past were. Gentlemen didn’t have it much easier – my husband has often complained about how hot it is to wear three layers of clothing to dance in the height of summer or when he has to dance in the heeled shoes and heavy periwigs of the eighteenth century. Your research will suddenly come to life both materially and physically, as you clothe yourself correctly and use the speech, physicality, movement and manners of the part you are playing. In 2015, the anniversary of the battle of Waterloo has been a focal point for re-enactment. I hosted a ‘Duchess of Richmond’s Ball’ in June and I wasn’t the only would-be Duchess filling a ballroom during those weeks with many events held nationwide. The ball was many months in the planning, even for a relatively small group of thirty of us. The easiest past was a venue and we chose to have an outdoor ball in my own suburban garden with a marquee on stand-by in case of rain. Those who criticise the cost of such events or who are dazzled by the aristocratic excesses of the eighteenth century can often forget that public sociability does not have to be on a grand scale or take place in a stately home. Gathering together as friends in an inn or a private house was the motor that drove the growth of subscription Assembly Rooms from the early eighteenth century. This is demonstrated as the event begins and the guests arrive as their historic persona. I perform introductions in the correct manner and guests chatter about historic matters of the particular day and mind their manners, adopting the formal politeness which the eighteenth century elevated to an art. Participation and imagination is key to a good re-enactment event in both demeanour and appearance. My guests dress as authentically as they can. Unlike some in the dance fraternity, I won’t criticise if someone uses a fabric or colour out of period. Not everyone has the budget or the time to make things perfectly authentic and it’s important to remember that re-enactment is supposed to encourage people to study history, not scare them off by criticizing their trimmings or hats! Many of the guests make their own outfits and, for those with the ability to sew, there are a variety of period patterns and online resources such as Colonial Williamsburg to offer help and advice. If you can’t sew, there are many period seamstresses, such as Marion May or Mrs Papendick. Such costumiers have become more numerous over recent years as interest in historic dance and re-enactment has increased. Turning to the programme of dances, researching historical paper dance notations is one of the more interesting tasks. I research dances from notations at archives such as the British Library or Cecil Sharp House in London and also note their music or match them with well-known music from the period the particular ball is set in. Most dance historians recreating dances may tweak them slightly to fit in a step or a pattern or set them to different tunes much as a dancing master of the period would have done, adjusting to local tastes and capabilities. Using these methods, historians such as Chris and Ellis Rogers have done much to make dance re-enactment more popular and accessible. Every ball needs music and you may be fortunate enough to engage a group of period musicians, such as the wonderful Green Ginger. There are also many recordings available, some of which will include notations. Historic dance does, of course, have to be learnt. My own method, as I’m dealing with a smallish group of people, who are reasonably experienced in the basic figures and patterns is to walk through the basic terminology and steps at the start of the ball and then to call the dances as they are performed, providing a reassuring vocal presence for the nervous or the new. Of course, nobody is perfect and like poor Mr Collins at the Netherfield Ball plenty of people go wrong, especially after imbibing some punch! However, this usually adds to the experience. No ball is complete without supper! I’m fortunate to have the help of my chef, Oleg Knippov, who when not engaged in playing a fiery Russian exile is a lecturer at a British university. His interest is in historic cooking, researching, replicating or reviving recipes. His cheat is to use modern ovens and cooking equipment, although he would be perfectly capable of using a spit and an open fire. Our banquet consisted of spiced honey chicken, salmon-en-croute with hardboiled eggs, poached salmon, salamagundi, celeriac remoulade, chicken liver pate, cheeses, cold meats and a variety of desserts including syllabub, pineapple sorbet, Eton-mess ice cream, apple and honey cake, sherry trifle, mincemeat cake, shortbread and scones. After the ball, at around 10pm, we were treated to a white soup, beloved of all Regency hostesses, which is a light chicken and almond broth. We also produced period punches and cordials, such as a spiced blackcurrant cup and a strawberry punch. All of the dishes he produced came from recipes popular in 1815. So it was that after a fine time eating, dancing and socialising, flaming torches lit the shadows, before carriages – well, cars and trains – removed the guests back to modern life, until our next foray. As the recent Austenland film demonstrated, there is more and more interest in re-enacting the past and enjoying the romantic aspect of dandies and duchesses. Re-enactment can be legitimately criticised in that people often opt to play ‘nice’ characters, who don’t get dirty and wear pretty dresses and this can make us forget that for many people, the past was, as Hobbes famously described in Leviathan whilst musing about the State of Nature, ‘nasty, brutish and short’. But for all this, I remain a firm defender of the pastime, which has improved my abilities as a scholar and hopefully enhanced my understanding of the periods of history that interest us. And let us not forget, it’s all jolly good fun – by far the best way to drink champagne is when it has been handed to you by a footman. Critics may sneer, but historical re-enactment of all kinds is here to stay, helped along by a dedicated band committed to bringing the past to life. I hope that every time I lace up my dancing shoes that in some small way, I contribute to this noble cause. As the American Declaration of Independence said in 1776 ‘we hold these truths to be self-evident, that all men are created equal, that they are endowed by their Creator with certain unalienable Rights, that among these are Life, Liberty and the pursuit of Happiness’. What indeed, could make anyone happier, than the pursuit of the pleasures of our ancestors? This post copyright © Miranda Reading, 2015. Sounds great fun! My husband and I, both disabled, are hoping to find a sympathetic group of dancers in East Anglia - travelling a long way is an issue - and if you know of one, I'd be most grateful. The healthful exercise [in moderation] and the fun of the historical aspects are what we are looking for. Good luck with your D. Phil, and never mind the stuffy critters who get uptight. So much fun, and without all the booze that often goes with events today! I do hope you are able to find somewhere; perhaps Miranda will know of a place! Hurrah for your wonderful essay!! I too am studying to be a professional historian (PhD Candidate, History of Science, Oregon State University) and also find re-enactment fascinating on many levels. We've learned much about early science from doing experiments using period lab instruments; learning dances from period notation and putting our modern bodies into them reveals aspects of the past that cannot be ascertained in any other way. Carry on and keep dancing! Sarah, I hope Catherine won't mind my using her website to suggest Dolmetsch Historical Dance Society or the Early Dance Circle. Both websites list groups across UK, though I don't know whether there's one close enough to you. If not, why not contact the nearest and ask them to help you set up a local group! The tutors are knowledgeable and very friendly. Ann H, DHDS newsletter editor. Ann, thank you! that's great. Aww I got excited there for a moment, but nothing near to me; I don't think anything exciting happens in Suffolk since the Bigods died out, unless you count Mary I arriving at Framlingham.